One of the many illuminated paths during Winter Lights at the Elizabethan Gardens. 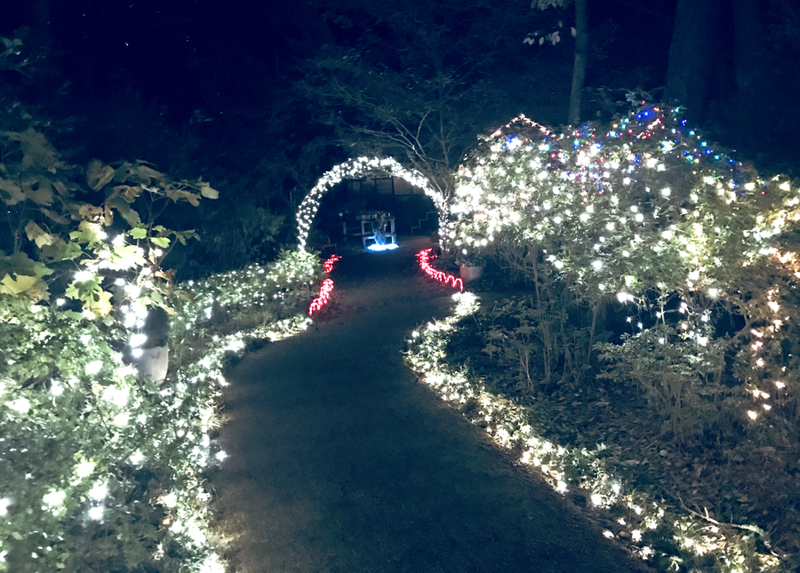 Winter Lights at Elizabethan Gardens is one of those Christmas traditions that is a reminder of how special the holiday season can be. Any time of the year is a great time to visit the Gardens, a 10 acre site immediately adjacent to Fort Raleigh National Historic Site on Roanoke Island. But on a cool—or perhaps even cold—winter’s night there is magic in walking along the paths and witnessing the thousands of lights that illuminate the statues and trees. The light show runs through the holidays until January 15 so there is plenty of time to check it out, but there is something special about the lights and Christmas. There are, of course, Christmas lights everywhere—and some quite spectacular. But what makes the Winter Lights so special is how wonderful the experience is for the whole family. In the middle of the Gardens there is the Great Lawn, and open space dominated by huge live oak and with a fire pit in the middle. Next to the fire pit, a large screen plays the version of Rudolph the Red Nosed Reindeer that was narrated by Burl Ives. Best of all, though, is an endless supply of marshmallows and tongs perfect for roasting the marshmallows in the fire. The artistry and creativity that has gone into some of the displays is remarkable. There are heron ponds that sparkle with shades of blue and sand colored lights around the edge. The statues that are so much a part of the wonder of the Garden are individually illuminated, creating a different vision of what they represent. Winter lights is truly one of the unique holiday treats waiting visitors and residents during this time of the year. If you are going, be sure to dress warmly. Roanoke Sound borders Elizabethan Gardens and the breeze off the water can be chilly. Any time of the year is a wonderful time to visit the Outer Banks. The best accommodations are always available at Joe Lamb, Jr. & Associate.